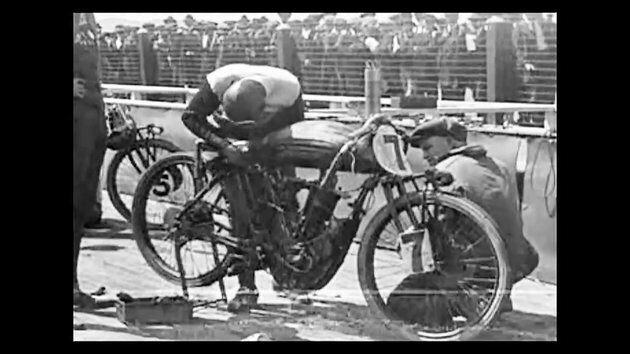 This is a truly special piece of American history, a rare and remarkable glimpse into the high stakes sport of professional board track motorcycle racing during the Prohibition Era. Shot at the height of the sport, the film not only captures an intimate perspective of what it was like to race on America’s infamous board track speedways, but the race itself represents the high water mark of the sport since its inception. It showcases some of the world’s most iconic pioneer motorcycle racers as well as some of the most revered and highly specialized machines ever built, all hitting record competition speeds at a time when the culture was at its most appealing. Nice video, enjoyed that very much. "The reasons for the lethal nature of motorcycle board track racing were easy to understand. Motorcycles, even in the 1910s, the heyday of the board track era, were capable of speeds approaching 100 miles per hour. The boards were oil soaked and slick due to the engines being of “total loss” design, meaning oil pumped by the riders to lubricate exposed valves and springs sprayed freely into the air behind the speeding bikes. Riders raced with just inches between them, sometimes even touching as riders jockeyed for position. The machines had no brakes, and spectators were separated from the speeding machines by just couple of 2x4 boards nailed between fragile posts." I imagined going back in time with an S1000RR. Can you imagine what they would think!? It's really interesting that they were wood instead of dirt. According to the Wiki's, it was the first banked track in the US which would have made it very fast, operated from 1920 to 1924 and then the track was moved to nearby Culver City. It was partially located on where the Beverly Hills Hotel is now, an icon of the area.